To date, the Nokia Lumia Icon has topped the list of my favorite Windows Phones. But if you invest $99 to buy the new Microsoft Nokia Lumia 830 via AT&T, you’ll be handed a thinner, lighter phone that’s equally robust, which you may even prefer to the older model. My one disappointment is that the global version of the phone that Microsoft loaned me did not include some of the best features of Lumia Denim, the firmware update that debuts on the 830 and similar phones. And on paper, the 830 is a step down from the Icon in display quality and camera resolution. Still, the 830 is a quality midrange phone with an upgrade path to some of Denim, backed by solid performance under the hood. And this is Microsoft’s newfound strategy: Attack the midrange and low end to increase its market share, with decent phones for everyday use. And if you act fast, you’ll get a free Fitbit, too. Like the Icon, the Lumia 830 appears cut from a solid slab of aluminum, but with a plastic backing carved out of Microsoft’s electric Lumia colors. Underneath hides one advantage over the Icon: an easily accessible (128 GB) microSD slot, supplementing the 16GB built-in memory. 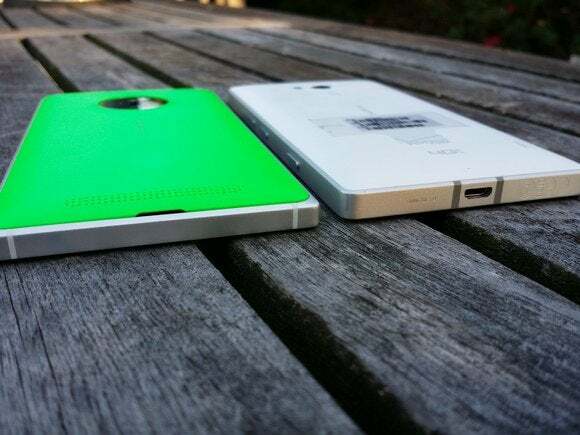 Placed next to each other, the Lumia 830 (left) is thinner, which you'll notice as soon as you pick it up, too. The differences extend to the internals. While both phones sport 5-inch screens, the 830 uses a 1,280x720 IPS display, a relatively archaic resolution in a generation where premium displays are moving to quad-HD resolutions. And Microsoft’s 830 also uses a 1.2GHz quad-core Qualcomm Snapdragon 400 chip alongside 1GB of RAM, a step or two down from the 800 chip the Icon uses. I wasn’t pleased with the effect that 512MB of RAM had on the Lumia 635, but right now Windows Phone apps running in 1GB of memory seem like an acceptable compromise. The transition between apps and the home screen staggered occasionally, but that seemed anomalous compared against the overall, smooth experience. Surprisingly, that extended to games as well. Windows Phone doesn’t have too many games that push the hardware to the limits, but Gameloft’s Asphalt 8: Airborne does. While the Icon powers the game fluidly, you’ll notice a tiny bit of stuttering with the 830. In all, however, the game plays more than acceptably. Ditto for games like Beach Buggy Racing and the like. This was shot in the afternoon, but the Lumia 830's display is perfectly legible throughout the day. When tested against popular benchmarks, however, the Lumia 830 doesn’t measure up. Using SunSpider 1.0.2 (where shorter is better), the phone averaged 1.24 seconds, more than double the 0.52 seconds the Icon required. With Antutu 0.8 beta (where higher is better), the Icon scored 24,600, while the Lumia 830 averaged 10,969--a 55 percent decrease. WPBench (where higher is better) also reported similar results: 505.0 for the Icon, and 242.8 for the Lumia 830--a 52 percent decrease. Inside the 830 sits a removable 2,200 mAh battery, compared to a 2,420 mAh battery in the Icon. I found it perfectly acceptable for all-day, moderate use (using it more to browse the Web and use apps than making calls). If that’s your typical use case, good news: Microsoft rates Wi-Fi browsing at 14 hours, versus 9 hours for the Icon, and 10 hours for video playback. That’s partially due to the lower-resolution screen, I suspect—which, I should note, is also more legible under direct sunlight than the Icon's, thanks to the IPS display technology. And if you want to recharge it, you have the option of wired or Qi-compatible wireless charging. While a Lumia camera can’t compete with a modern SLR, I think most people now recognize that they’ve replaced the point-and-shoot. In full light, the 10MP PureView sensor grabs crisp, clean images with vibrant color. Note than the sensor in the Lumia 830 is 0.29 inches, versus 0.4 inches for the Icon, so there’s less surface area to capture images in low light. The 830 has an f/2.2 lens. Even on a cloudy day, the Lumia 830 color looks excellent, and the details are sharp. I wasn’t as impressed with the Lumia 830's low-light shots as I was with the Icon's, or the HTC One (M8)'s, whose sensor was specifically designed for that purpose. 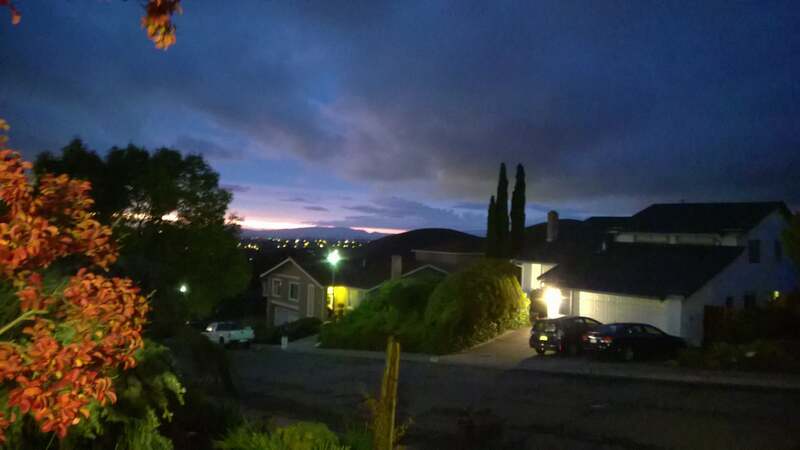 I noticed a hazing effect when shooting into a sunset that I didn’t with the other phones, and low-light images were somewhat noisy. The 830 has optical image stabilization, however, which does help steady the camera’s lens when taking those longer-exposure shots. That helps the camera continuously stabilize itself when shooting video, too, at its maximum resolution of 1080p. 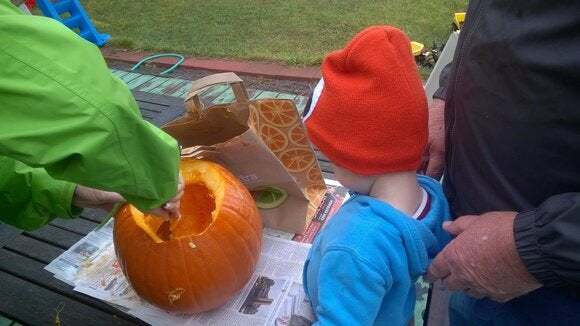 In low light, things get grainy fast. Although the front-facing camera on the Lumia 830 is a paltry 0.9MP, a new app, called Lumia Selfie, helps solve that shortcoming. With Lumia Selfie, you can shoot a selfie with the external camera, pointing it at your face. You can’t see yourself in the viewfinder, but the camera looks for your face, alerts you with a rapid series of beeps, then snaps the shot. Aside from a tendency to focus on the background, the app works well, putting your face front-and-center in the frame. Additional camera-specific apps include Bing Vision, Lumia Cinemagraph, Lumia Panorama, and Lumia Refocus. The latter three didn’t come with the phone, but I could download them from the Store. As I mentioned before, the Lumia 830 does include Denim, just not the fun stuff. Lumia Camera has been left out. And the other feature I’d like to try out, Cortana’s active listening mode, will not appear on the Lumia 830 (but will on the Icon, the 930, and the 1520.) Cortana, Microsoft’s digital assistant, normally requires a keypress to trigger it. When the feature goes live on the other phones, you’ll be able to say “Hey, Cortana!” and ask her to do your bidding. 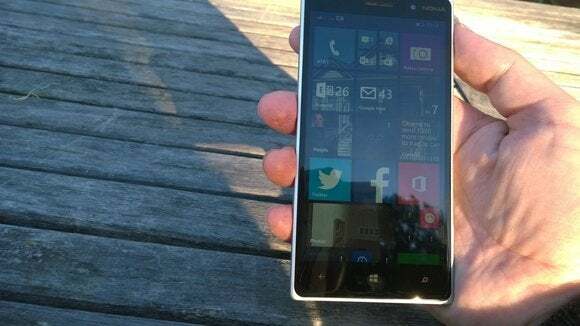 Otherwise, the Lumia 830 also ships with Windows Phone 8.1 Update 1, which offers the opportunity to group applications into folders, set up a VPN, and group SMS messages for easy processing. 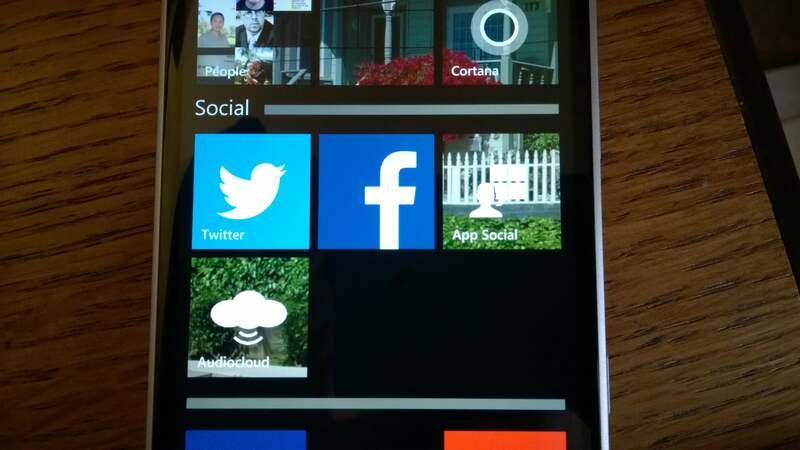 Live folders are a handy feature in Windows Phone 8.1 Update 1. However, I do like one Lumia-specific Denim feature, the integration of either Bing Health & Fitness or Bing Weather onto the lock screen. I still think it’s odd that Microsoft chose to bundle the Fitbit Flex, not its competing Microsoft Band, with the phone. But if you’re a walker, you don’t need either; the Lumia 830 is one of the few with the SensorCore package, which has a built-in pedometer. In lock mode, you can automatically see how many steps you’ve taken, which is handy. As I’ve noted elsewhere, I usually carry two phones: a Samsung Galaxy Note 3, and one of several Windows Phones, swapping SIMs back and forth as needed. The Android ecosystem seems obsessed with specs, dissecting screen size, display resolution, memory, and CPU speeds to determine the best solution. Move to a Windows Phone, though, and those distinctions just don't seem that relevant. 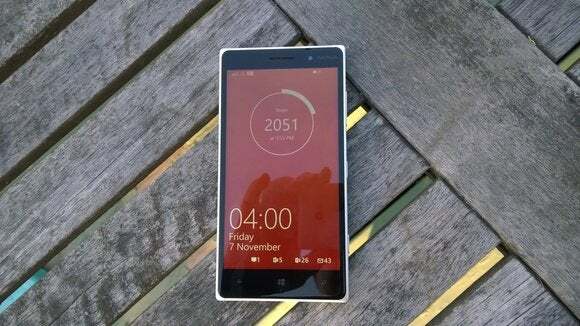 As the benchmarks showed, the Lumia 830 is a substantial step down on paper. But in real-world testing, the differences weren't that noticeable. I really liked the Lumia Icon, and HTC has done a fine job with the One (M8). 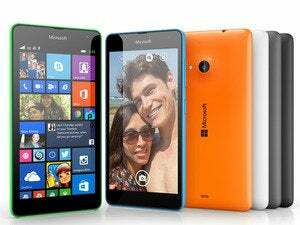 But the Lumia 830 is very good phone, and a relative bargain to boot. Microsoft correctly labels the Nokia Lumia 830 as an "affordable flagship," with an appealing mix of performance, features, and price. And the phone will improve somewhat once Microsoft pushes the Lumia Camera app to the phone.